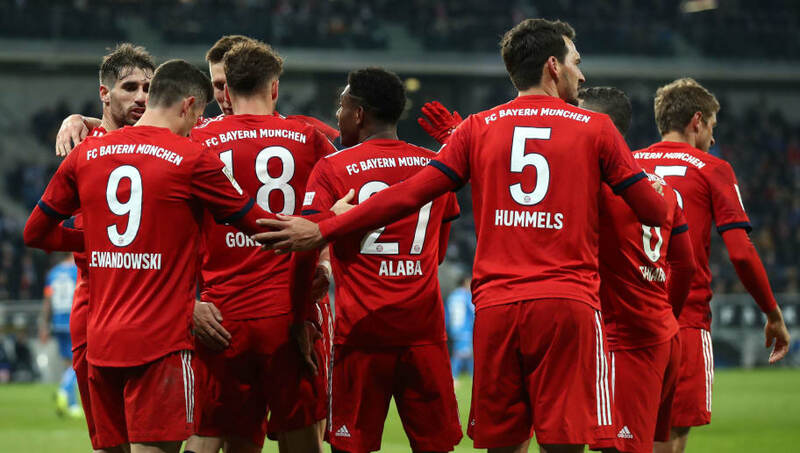 Bayern Munich went within three points of the top of the Bundesliga on Friday night as they made a winning start to 2019. ​​Munich dominated the opening stages and enjoyed the majority of the possession. The Munich wingers were given acres of space throughout the game as Bayern went on attack after attack, but failed to capitalize on these early chances. ​A goal eventually came for the Bavarians. Kingsley Coman’s cross met the head of Robert Lewandowski - who should have scored, only for Oliver Baumann to make a good initial save before Leon Goretzka reacted quickest to the loose ball and blasted home the opener from a tight angle. ​Bayern’s lead was doubled when they countered from a Hoffenheim corner kick. Coman was sent bombing down the wing, and the Frenchman's cross found Goretzka to poke the ball around Baumann to claim his and Bayern’s second of the game. ​Hoffenheim were allowed back into the game at the start of the second half. Shortly after an early double substitution, the home side went on a counter attack and Leonardo Bittencourt's chipped ball forward was met by Nico Schulz, who expertly found the bottom left hand corner. ​The home side continued to grow into the game and were denied an equaliser from an exceptional save from ​Manuel Neuer; the German quickly diving to his bottom left corner to get a important hand on a Joelinton header. ​Robert Lewandowski had a poor night by all accounts but eventually manged to do what he does best, tapping home a ​Thomas Müller cross late in the game to kill off Hoffenheim’s chances of an equaliser. ​Starting XI: Baumann (8), Kaderabek (6), Hübner (6), Vogt (6) Posch (6), Schulz (8), Bittencourt (8*), Demirbay (5), Kramaric (7), Joelinton (7), Belfodil (6). Substitutions: Geiger (6), Grillitsch (6), Szalai (5). ​Bayern won the match in the first half and looked incredibly comfortable throughout. The Bavarians were effective in their use of the massive spaces left in the wide areas, and created numerous first half chances. Joshua Kimmich and Coman controlled both wings, while Hoffenheim’s defence struggled with the forward players all afternoon. Goretzka and Müller were able to create the chances for Bayern and late substitute ​James Rodriguez added to that. ​Starting XI: Neuer (7), Kimmich (7), Süle (6), Hummels (6), Alaba (7), Martinez (6), Thiago (6), Goretzka (9*), Coman (7), Müller (7), Lewandowski (7). ​Leon Goretzka scored a brace and put in the game's stand out performance as Bayern dominated. The young German has now scored four goals this season - starting to bring back a part of his game which didn't make a smooth transtition with him when he moved from ​Schalke. ​Thiago drifted in and out of the game, and struggled to stand out in a dominating first half performance. His replacement James Rodriguez had more effect on the game in his scant time on the pitch at the end of the match. ​Hoffenheim travel to SC Freiburg next Saturday hoping to get back to winning ways in the ​Bundesliga. Bayern host struggling Stuttgart at the Allianz Arena on the Sunday as they try to close in on Dortmund at the top of the table.